India's election commission on Monday banned a firebrand Hindu nationalist state chief minister from campaigning after he called Muslim voters a "virus." The saffron-clad Yogi Adityanath, from Prime Minister Narendra Modi's ruling Hindu nationalist party, had been warned this month about his campaign speeches, the election commission said in its order. The commission said Adityanath, a holy man who is chief minister of Uttar Pradesh state, had spoken about a "green virus" in a speech last week, apparently referring to Muslim voters who he said were being wooed by opposition parties. 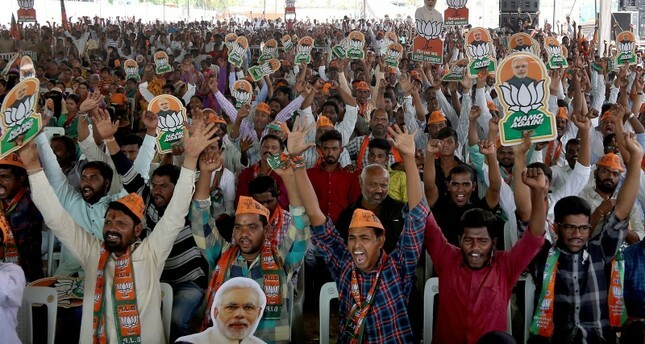 Modi's Bharatiya Janata Party (BJP) has been playing to its nationalist base and painting its rivals as soft on terrorism and eager to appease Muslims, who make up about 14% of India's 1.3 billion population. A BJP spokesman claimed the party was inclusive toward all communities and its leaders were discussing the ban on Adityanath. "The party believes in all-together development for all, and we don't believe in any polarization," the spokesman, Harish Srivastava, said. A spokesman for Mayawati's Bahujan Samaj Party, which is in an alliance with another regional party in Uttar Pradesh, could not be reached. Last week, BJP President Amit Shah referred to illegal Muslim immigrants as "termites" and vowed to throw them into the sea. Surveys suggest that Modi's ruling alliance can win a simple majority this time, a poorer performance that in the last election in 2014, when it secured a commanding majority on a promise to turn India into an economic and military power.